I found these pictures on the intraweb of Worms. Does anyone know where on Cross Lake this restaurant was or have any additional information on it? I have many fond memories of this restaurant eating there with my parents when I was very young. I often was amused at the irony (had no idea what irony was at that young age) of a place that had such good food and was named “Worm’s”. As I remember it they had round tables with a lazy susan in the middle. Sorry I cannot give you the exact location of Worm’s. I remember eating there thru the mid-1960s. The lazy susans, stuffed bobcat, and hornet’s net stick out in my mind. My mother-in-law has the hornet’s nest. The lazy Susan tables were all sold. Hi. Really love the lazy susan table. Would you know anyone interested in getting rid of theirs or selling it? The player piano sticks out in my mind. Guess I had never seen or heard of one before. Great memories! I was just telling my son about this wonderful old restaurant from my youth and so found this site. 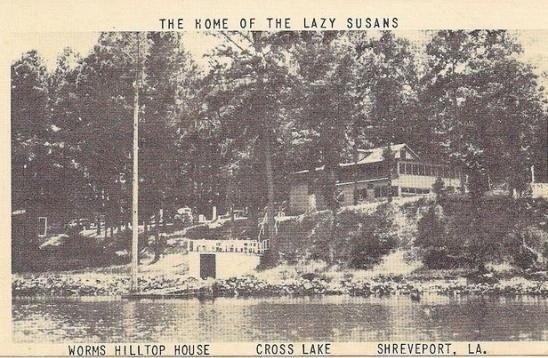 My dad used to fish on Cross Lake and my mother and brothers and I would meet him in the evening for great catfish, hush puppies and relish trays on the Lazy Susans. I remember driving almost straight up a twisting road to get there but, having left Shreveport 60 years ago, could not begin to tell you where it was. Does anyone know when it closed? Is the building gone? And, yes, how could anyone forget a restaurant named Worms!?! THE BEST place to eat chicken and catfish. AMAZING. DO you remember the stuffed bobcat and the hornet’s nest in the lobby? And the bizarre intercom from the register to the kitchen below? And the dumbwaiter that brought up the food? The owner’s last name was Worm. I met his daughter about 30 years ago when I was still living in Shreveport. If I had a time machine, the first thing I would do is go back to Worm’s for dinner! Yes, fond memories! Great restaraunt. So was Abe’s Steak and Seafood and Original Ernest’s Supper Club. I also remember stopping at A&W and Southern Maid Donuts on Texas Ave. on the way home to Marshall. Remember the talking crows at Soutern Maid? Those were Mynah birds at Southern Maid. They would harmonize singing Stephen Foster songs about the old south. Worm’s Hiltop was located on South Lakeshore Drive just before the Shrine Club (park). It was not very easily seen from South Lakeshore but as you probably have noticed on the lake side it was very nice.I lived near by in the 1960’s. Those were the days! Worm’s was my Great Uncle Cyril’s (CJ) place. The location is now a big house which is fenced in with black iron fencing just down from where Smith’s used to be. The lazy susan tables were made from the axels of model A’s or T’s…can’t remember which, but I have one of the rectangular tables which no longer has the lazy susan attached. My mother decided to redo the table in the 80’s (because it was so big) and had it cut into an oval, and the legs were shortened to coffee table height. (Ugh) It is still a beautiful table. Cyril was my Great Grandfather’s (Ralph Worm) brother…and I have memories of going to his home on Cross Lake when I was a kid, during the 70’s and early 80’s. At that time, he lived close to where the 220 bridge crosses South Lakeshore, and the Hilltop was long gone by then. My dad grew up @ the hilltop. There were 2 tiny cabins up by the road. Dad and his mother and grandmother lived in one and a lady named Pinkie lived in the other. Pinkie and my great grandmother worked at the hilltop house and fished when they weren’t in the restaurant. Chances are, you might have eaten fish that those two ladies caught! The Hilltop property was next to the little store and marina. Later, Pinkie worked at the little store for many years. Worms Hilltop House was a restaurant in the 1950’s (perhaps earlier). Its slogan was “Home of the Lazy Susan’s” because: they would bring a huge lazy Suzan to your table (I think there were 4 tiers) loaded with appetizers. It was all you could eat, and there was no rush. In a family, very relaxed environment, you could have an hour of conversation and . comraderies before the main course. When you were ready, you would let the waitress know what you wanted: either fried chicken, catfish, or (I think) frog legs. They would remove the appetizer lazy susan and bring forth, again, a huge lazy susan with whatever your family ordered. If everyone ordered catfish, there would be no frog legs or fried chicken. But there were always a HUGE assortment of other goodies, such as cole slaw, potato salad, a variety of pickels, cheeses, cracker, jams, picked mushrooms, and lots of other nibbling’s. My father bought Worms from C,J, Worm In 1950 . Place had some great Lazy Suzan Tables , one seat over Ten people. WE served fried chicken and catfish with all the trimmings for $2 00 a person. I pealed a lot of potatoes for french fries. My father was John Keeth Lane and I am Keeth M lane and yes Keeth is Spelled right. I have some old post cards shoeing Mr Worm. and some pics of friends from Fair Park High. HAVE SOME GREAT MEMORIES. I live on Cross Lake, my parents went to Worm’s as children, but no one seems to remember exactly WHERE it was–there are 2 schools of thought, near Shriners or down from Smith’s, I would love to find the true location! I have an old postcard that shows Worm’s high on a hill above the lake–hilltop–which makes me think it’s near Shriners–the area around Smith’s seems low, but as you go towards willow ridge it gets steep. Once and for all, where the heck was Worm’s?? I’m now 84 and remember going there with my Parents and Grandparents in the late ’40’s. One item I’ve not seen mentioned is the sign that said “The Fish you eat today slept in the Lake last night. I remember that sign in front of the building. I also, remember going into the lobby and being seated on a sofa or an easy chair in front of a huge fireplace with a blazing fire until our table was available – then looking out over over the lake while dining on a variety of delicious foods. That was back in the early 50s and was an occasional treat for a group of young women to enjoy. I am trying to find the name and picture of a bakery/reception hall/ maybe restaurant that a Mrs. O’Neal owned in the 1950’s and 60’s. I thought it was on Cross Lake and she lived in an area behind it. My mother would help her serve and bring me with her. Once, being the bookkeeper at Western Auto, she talked them into having their Christmas party there. The dining room had a stage.